Art may not be the first thing you think of when you are deciding how to position your brand image or increase revenue, but you would be surprised at how powerful art strategy can be. Think about it, art and artists provide the exact ingredients that keyed-in marketing strategists are looking for : originality, authenticity, emotion and a link to emerging trends. When you work with an artist, you essentially enter their world. It is their unique aesthetic, concept or identity that will be diffused into your brand or product. In 2003, Takashi Murakami brought his unique Superflat-aesthetic inspired by manga and anime to Louis Vuitton bags and changed the relationship between brands and artists forever. The collection was a run-away success and has now become a sought-after collectible. Yet beyond this commercial success, the impact on the brand was enormous. In one fell swoop, LV moved from your mother’s favourite brand to hanging off the arm of Paris Hilton and just about every other influencer at the time. The collaboration propelled LV into the 21st century and opened it up to a new generation of clients. We at ArtFlow have defined two essential strategies that nearly any brand can leverage through art. The first is ‘Product’ and the second ‘Patronage’. ‘Product’ is linked to commercial strategy, while the latter is about building brand prestige. 1. Product Launch - So you have an amazing product to launch, but your know that press and social media influencers will want something unusual to ensure their attendance. Artists are uniquely adapted to creating unforgettable experiences and environments. When Kate Spade opened her London flagship store, she invited performance artist Jennifer Rubell to create a unique happening in the window display. Guests were given passes to enter and were fed delicious cakes by a doll-like maid as the press and passers-by looked on. 2. Limited Edition - This is a great strategy as it is low risk and can be used to test new audiences for a brand image without making major changes. For example, Vilebrequin recently invited cutting-edge artist Alex Israel to create a limited-edition collection for their swimwear range. They connected their brand to his LA-based, West-coast uber-cool art vibe. What's more, limited edition lines often sell out and become collectible long-after the initial release, such as Jeff Koon’s champagne box-set for Moet-Chandon. 3. Advertisement - I can’t help feel that so many brands are missing a trick on this one. Again artists can bring unique authenticity and individuality to advertisement campaigns that leave the viewer wondering if they are looking at an advert or a piece of art. The difference : superficiality vs. depth. The best art leaves us with more questions than answers. 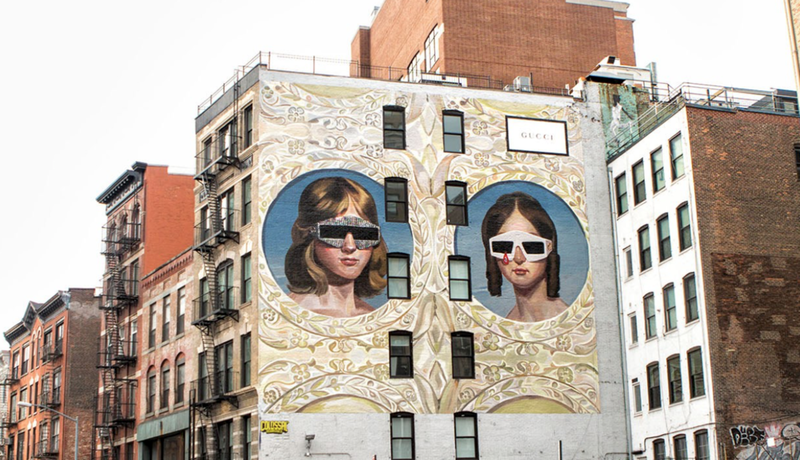 Hence Juergen Teller’s campaign for Marc Jacobs, breaks all the codes of fashion advertisement, Liu Bolin’s collaboration with Moncler creates something indefinable and Ignasi Monreal’s campaign for Gucci delves deep into art history. 4. Flagship Design - we all know about the star-power of inviting Philippe Starck or the much-missed Zaha Hadid to design the interior of a flagship store, restaurant or bar : but surprisingly few have hit upon the potential for Artist star-power in this context. The Etienne Marcel when it opened in Paris was the place to be with it’s uber-cool interior designed by artists Pierre Huygues, Philippe Parreno and M/M. Sketch in London continues to attract the in-crowd, while Damien Hirst’s Pharmacy draws customers curious to eat surrounded by his art. Now let’s move onto the second approach to leveraging brands through art. This is what we call the ‘Patronage’ strategy. It is about building a connection for your brand to the art world in order to leverage prestige, cultural philanthropy and communicate to clients in a non-commercial manner. 5. Art Prize - This is an excellent way to position your brand in the art world in exactly your own terms. An art prize provides the platform for media communication, social media content and clients events, such as a gala dinner or public exhibition in collaboration with a prestigious museum. The focus of the prize can be designed to reflect the values of the company, such as innovation or sustainability, and involve key members of the arts community in order to give total legitimacy. A great case study is the Swiss Emerging Art Prize that we recently launched for the Société Général Private Bank Switzerland. SGPBS were able to create a clear positioning for themselves on the Swiss national art scene and - most importantly - genuinely provide financial support and visibility to talented young artists. 6. Art Sponsorship - Art museums, such as Tate Modern and the MOMA, are among the top tourist attractions in cities around the world. While art fairs have become a hugely successful phenomena in recent times with the leader, ArtBasel, recently expanding to Miami and Hong Kong. Nearly every major city now has an important art fair which attracts huge crowds every year, from Mexico City to Abu Dhabi. Not to mention major art events, such as the Venice Biennial which brings in thousands of international visitors. These represent highly strategic platforms for sponsoring and leveraging your brand amongst art lovers. 7. Art Collection - This is of course not a new one. Many major companies and brand have understood the power of building a quality art collection. Banks, insurance companies and fashion brands have long been in the game, but car manufacturers such as Daimler or BWM and increasingly Tech companies, such as Google and Microsoft, are adopting this approach. The advantages are plentiful - the prestige of art for client meetings, a stimulating work environment for staff, communication and event opportunities, and of course the possibility of the investment taking on value over time. 8. Art Foundation - This is the next level of holding a corporate art collection. A foundation can be created to house an already existing collection, but also it gives a platform to build exhibitions beyond the corporate holdings. The impact of a brand-founded non-profit cultural institution open to the general public is clear, but there are also many administrative and tax advantages. The success and international renown of the Pinault Foundation in Venice, the Louis Vuitton and Cartier Foundations in Paris and the recently opened Deutsche Bank Foundation in Berlin can be seen in the fact that they rival major tourist venues in these cities. 9. Art Commission - Art commissions can take place in many contexts. They can be combined as part of an art sponsorship program, such as the Audemars Piguet annual art commission at ArtBasel, or as part of an art collection strategy. Many major brands and companies have engaged artists to create unique works for their headquarters, which demonstrate their values and engagement in art. 10. Internal Innovation Workshops - Much can be learned from the ideation processes of artists. The latter can be most easily defined as a non-functional approach to creativity. Today artists can work in virtually any medium to create art. This total freedom is often paired with serious philosophical reflection on human nature and the world we live. After all, it is said that ‘artists are the mirror of society’. Design Teams and Management are often locked in processes that inhibit free thinking. ‘Think Like an Artist’ is a unique innovation workshop designed by ArtFlow to help companies leverage their inner-artist. Now you can get to leveraging your brand with art like a marketing-ninja!